Command Large Matte Black Double Hooks give you options for every room and every person in your home. 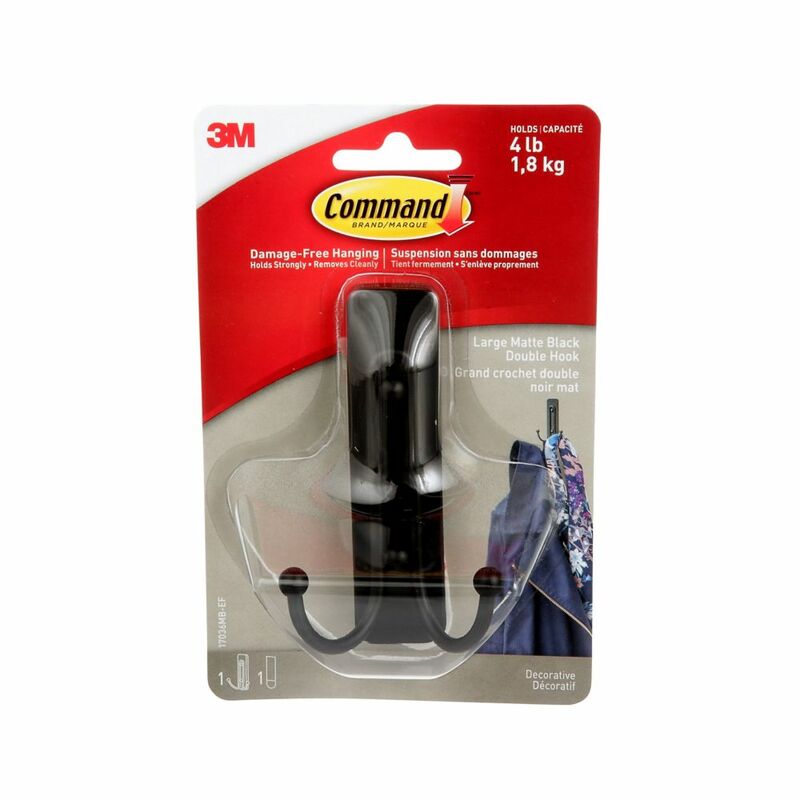 Using the revolutionary Command Adhesive, Command Large Matte Black Double Hook holds strongly on a variety of surfaces, including paint, wood, tile and more. Yet, they also come off cleanly - no holes, marks, sticky residue or stains - so you can take down and move your Command hooks as often as you like. Reusing them is as easy as applying a Command Refill Strip, so you can take down, move and reuse them again and again! Great for coats, hats, scarves, bags and more! The Closet Culture Closet Pole Hook snaps easily into the Closet Culture Wood and Wire Shelf Bracket (sold separately). It features slide-through technology that allows hangers to pass along a single or multiple connected poles freely. The versatile design allows 1" to 1-5/16" diameter closet poles to snap in the hook securely. EVERBILT Heavy Duty Swivel-Sheave, Double Hook Pulleys are strong, durable and used to raise loads of an indicated amount of weight. The wheel is free to rotate and easily lifts loads by applying little force. Direction of the force can easily be changed. Two scissor hooks make for easier rigging and secure connections. Each pulley has an oil impregnated bearing to extend pulley life. Axle and sheave are removable. Do not use with wire rope or cable. Increase your storage and organization space with Husky Storage, which easily assembles in minutes and is ideal for use in the garage. Accessorize the storage rack with single and double hooks suitable for hanging all varieties of tools, bags, equipment, clothing and other items up to 40 lbs. The heavy-duty steel construction provides ultimate strength and reliability, while the rugged black powder coating is durable for long term use. The Hooks are rubber coated to protect hanging gooods and can be placed anywhere there is room - on a hook plate, or directly on the upright, at a height of your choosing. Installs easily in seconds. Large Matte Black Double Hook, 17036MB-EF Command Large Matte Black Double Hooks give you options for every room and every person in your home. Using the revolutionary Command Adhesive, Command Large Matte Black Double Hook holds strongly on a variety of surfaces, including paint, wood, tile and more. Yet, they also come off cleanly - no holes, marks, sticky residue or stains - so you can take down and move your Command hooks as often as you like. Reusing them is as easy as applying a Command Refill Strip, so you can take down, move and reuse them again and again!